World Series of Fighting straw weight champion Jessica Aguilar (17-4) is set to make her first title defense, but she’s not ruling out a passion she had early on in her life. 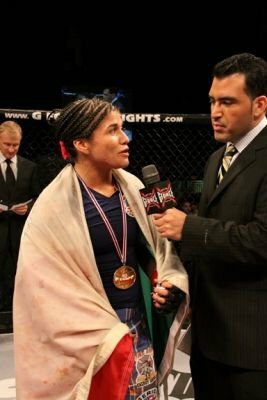 Aguilar will defend her title in which she won back in January against WSOF newbie Emi Fujino (13-7) who will make her debut in the promotion and will make her first visit as a fighter to the United States. But Aguilar, of Mexican decent, who once dreamed of gracing the big screen said she hasn’t ruled out acting out of her life. She spoke to the host of The Roman Show Rodolfo Roman about her upcoming fight. Right after she won the title actor Danny Trejo was present to congratulate her inside the cage. Aguilar currently holds an eight fight win streak, while her opponent is coming off a loss. The American Top Team standout said she is “excited” to fight for the first time in her career in Las Vegas, better known as the fight capitol of the world. She also addressed her recent to New York as she was invited for the 25th annual GLAAD Media Awards. She also talks about charity work, the success she’s had in 2014 and more. Click below to hear the complete interview.